So when an AI gets to my target location, it calls a function that is on my HUD, I also tried using a custom event - the event and function both says to take 1 life off in my HUD. And I guess this is where it's going wrong; in my targetlocation is where I trigger both the event and function, maybe I am not doing it right ? get access to Lives Var of that controller, just draw out cord from player controller reference, disable context sensetivity and write "Get Lives Var". 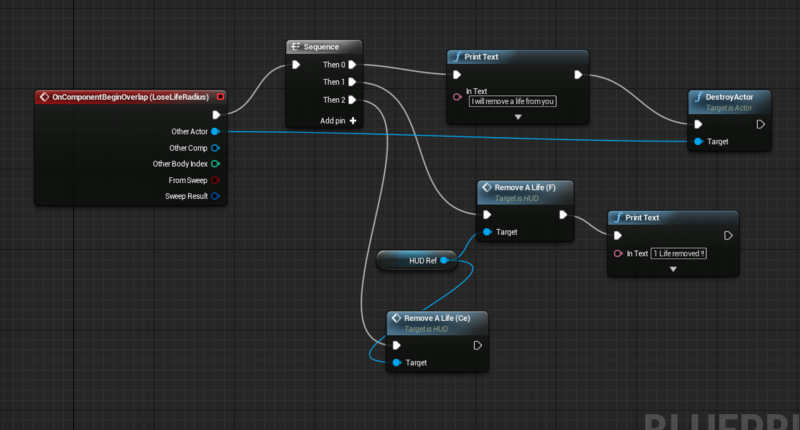 My lives var is in my HUD widget blueprint. I need all players to share the lives. yep that value it's more fitted for the gamestate. Anyway, try to print the "HUD ref" value. Can you show where you set it too? move it to gamestate, what is that ? do you mean the level blueprint ? 1- "I will remove a life" gets printed? 2- HUD ref is valid? it is valid, it compiles with a tick, the hud reference is a variable with my hud selected - the hud is where my lives number is. If it compiles, it doesn't mean a variable is valid. Anyway, about the question number 1? Blueprint not compiling when project is loaded. Is the Create Widget node replaced by a Construct node?